Lilydale Squadron of the Australian Air League had a surprise at its recent recruiting display when local member Tony Smith MP, Federal Member for Casey and Speaker of the House of Representatives turned up for a “flight”. 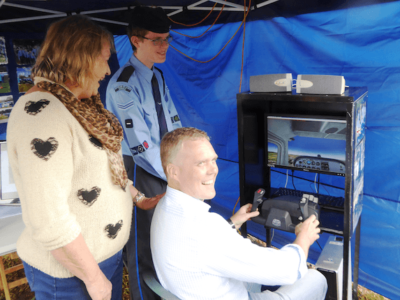 The Squadron was demonstrating its mobile flight simulator when Tony Smith, accompanied by Christine Fyffe MP, state Member for Evelyn, requested to have a go. The MPs were provided excellent instruction by Corporal Michael Vieth of Lilydale Squadron and we’re happy to say both had a safe landing. Throughout the day there was a line up of children waiting to try out their flying skills and whilst waiting they enjoyed a presentation on what the Air League has to offer. The portable flight simulator is proving to be a valuable tool in attracting attention to the Squadron at promotional displays and in the last few weeks they have signed up a number new members as a result of the displays with our flying machine.